Madhya Pradesh is one of the largest states of india and also call heart of India. This Tour Package of 03 Nights and 04 Days is customize for the tourists who want to explore some of the most famous spiritual and historical sites of Gwalior, Orchha and Khajuraho. On arrival at Gwalior airport/railway station, meet our representative who will be there for your welcome. After a warm welcome, he will transfer you to your already booked hotel in Gwalior. Check in at the hotel and enjoy delicious lunch. Thereafter, we will leave for the local sightseeing tour of the city. 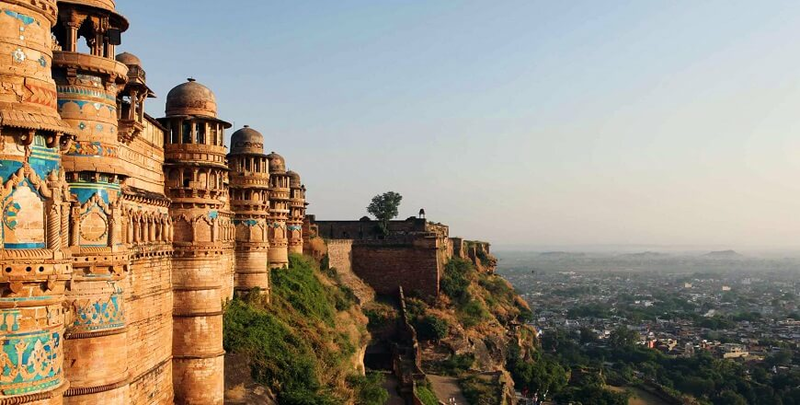 We will start our day tour by visiting the Gwalior fort, one of the largest forts in India. Build in the 8th-century by Man Singh Tomar, this hill fort comprises of two main palaces, a defensive structure, Man Mandir and Gurjari Mahal. After exploring Gwalior's beautiful hill fort, we will proceed to visit the famous Vishnu temple and seek the blessings of Lord Vishnu. This temple was built in the 11th century and has a stunning interior that grabs tourists' attention. In the evening, we will return back to the hotel for a relaxing overnight stay. After breakfast check out from the hotel early in the morning and drive to Orchha, this is around 124 kms away from Gwalior. On reaching Orchha, check in at the hotel and have breakfast served at hotel's restaurant. Afterwards, we will leave to visit the popular temples in Orchha like such as the Lakshmi Narayan Temple and Chaturbhuj Temple. The ancient temples of Orchha were built in the 16th and 17th century by Bundela rulers. After witnessing the indescribable beauty of the temples of Orchha, we will return back to the hotel for a comfortable night stay. After breakfast in the morning, we will check out from the hotel in Orchha and drive to Khajuraho, which is about 174 kms away. On reaching, check in at the already booked hotel and thereafter leave to visit the Western Group of Khajuraho which comprise of 14 gorgeous temples, including Matangesvara, Chaunsath Yogini, Kandariya Mahadeo, Varaha, Parvati, Lalguan Mahadev, Lakshmana, and Nandi, Chitragupta Devi and Jagdamba. After exploring these beautiful temples, we will return back to the hotel for a stress free overnight stay. In the morning after breakfast, we will go to explore the Eastern Group of Khajuraho which houses seven temples. Out of them, three are Hindu temples and four are Jain temples. The name of the seven temples of eastern group includes Vamana, Javari, the Parsvanath, Adinath, Shantinath Ghantai temple and Brahma. The Parsvanatha temple is the largest one among all. Have witnessing to the natural beauty of these temples, and arrive for Departure at Airport or Railway Station with lots of sweet Memories.